Last edited by Claushouse; 06-29-2017, 07:01 PM. this sounds awesome nice work! this is good. after winning 2vs2 league, i needed something else. i see the subbing and the base lines to be a point of contention at some point possibly. especially if you cant go down in rec, why would you ever sub yourself out for poor play? lag sure, but not for poor play. the basing lines were the other thing. would you register someone's main ship when signing up? or would the host do the best job they can while everyone spams them with 'jav me!'? I think base gonna be an issue anyway. Like spiders going for a 50-0 rec etc. A Terrier would take less risks. Nice idea Ogron and co. But I wanna 'complain' about one thing. I know the majority of the players is from the usa/canada. But for me personally it will be 'impossible' to get games played during the week time, especially in base. I would personally rotate those times, like make it tuesday wb-jav-base, wednesday jav-base-wb, thursday base-wb-jav. So euro's have a chance to play in every league during the week. No way I will play at 1 am during the week.. I know there are freaks like turban who will show. Love u . For me personally it wouldn't matter because even 5 pm est is too late at weekdays. Just wanna say it's too american based, which I can understand though. The bot will pick the best sharks for every team first, from a full shark list. 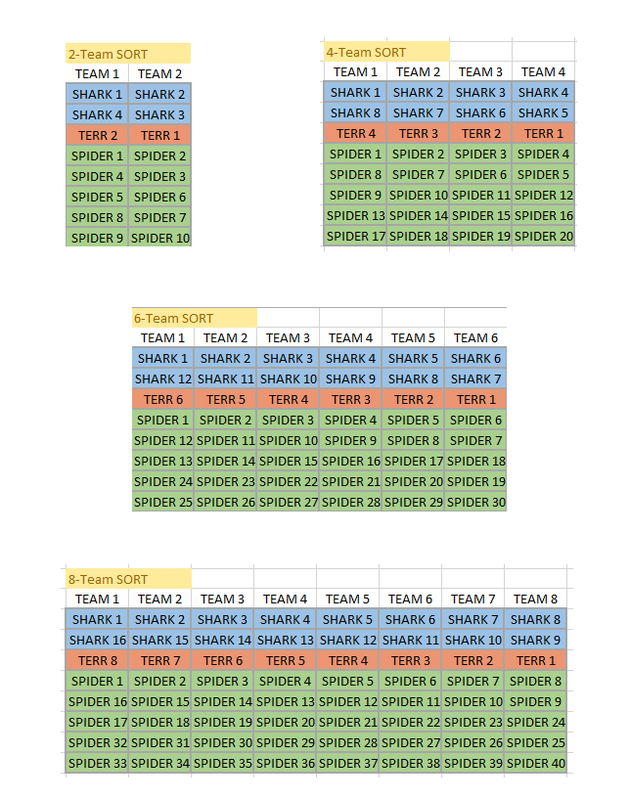 Then it will move on to the terr list (eliminating any sharks taken from that list), and pick the best terrs for each team. Then the bot will move to the spider list (eliminating all sharks and terriers picked from the spider list). A small list of trusted, mature veterans in each league will be assigned captain in base games and will be able to change people's ships before the game starts (or during the game), and if that trust is abused they will be removed from the list. But the bot will sort sharks and terrs to teams first, then spiders. I don't expect captains to deviate much from the initially assigned positions, as you need the best possible sharks and terrs for basing games to be competitive and fun. 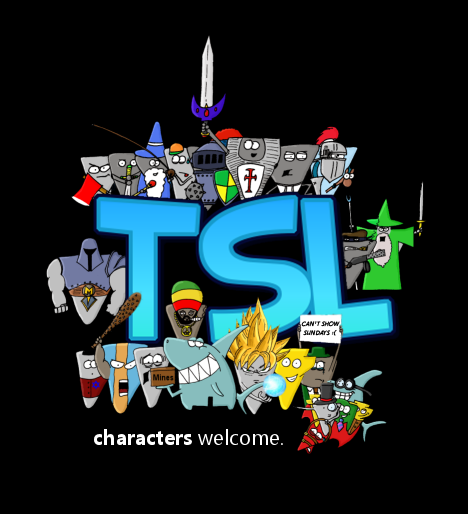 There are no wbs/javs/lancs available in TSL. Terrier, Shark, and Spider only. We're not going to let it devolve into a shitfest. If Vehicle or Major is assigned as spider, and I'm assigned terrier, and they want to switch with me one game, and the captain is fine with it, that works. If pokieball7437 is asking to terr the team into the ground, that's not going to happen. You can't ruin the game for the 15 other people playing so 1 person gets to terr. Shark and Terrier are essential to the competitiveness and fun of a lot of people, and thus the bot will select the best available for those positions. Thankfully, this is a problem unique to basing, and there are no such issues in warbird and javelin. My spidering formulas have, for years, ignored your KDA and deaths, with the intention of not rewarding campers. Jones on the losing team going 102-0 is worth 13$, while Okyo on the winning team going 101-95 with 2 teks is worth 20$. Your team's performance is factored into your personal score. 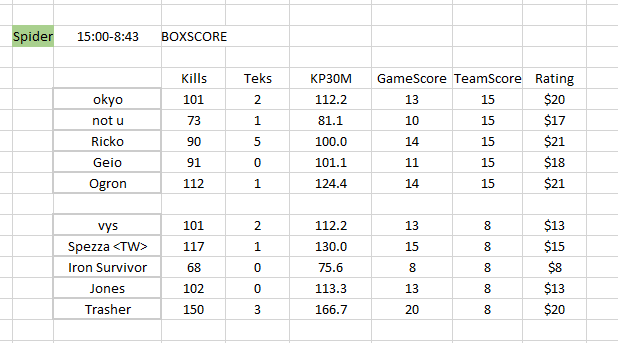 Kills, teks, and winning are valued -- reccing with KDA isn't. As for terriers, KDA is capped at a certain point, and teks and kills matter. Also, I'm not sure a terrier playing "safe" is a bad thing. All the ratings value winning and aggressiveness across all three leagues. edit: nvm i see its fixed timeslots. could be fun though you already knew my opinion. I'll show to support the league unless my summer schedule somehow gets clogged (which, lets be real, is unlikely). it's cute that turb almost thought he'd have plans over the summer.